Yesterday and today very near all the snow went off. Rather cool. Went to band practice. Here's the promised photo of Lennie's father, Josiah Davis. 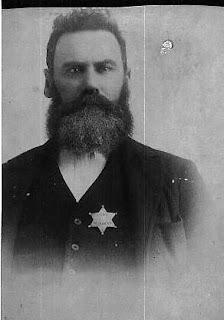 Family history has it that Josiah was town marshall at Wakefield. If there are Wakefield historians reading this and who have more information about Josiah and his badge, please leave a comment as we would love to hear more. Josiah Davis (1836-1912) and his wife, Martha Jane Crawford Davis (1838-1917) were born in Ohio. The 1880 census shows the family living in Illinois (where Lennie was born in 1881). Sometime before the 1990 census the family moved to Wakefield, Nebraska. Charles Leonard (our "Lennie") was the youngest. In a future entry we will show a photo of Lennie as a young adult with his parents and siblings. And we will soon begin reading about an important event that has the town abuzz. Guess they weren't having a hard winter if very near all the snow "went off". I like that expression! I wish that our snow very near all went off. Are you folks getting hammered again? No, we are not presently getting snow. But, boy, oh, boy, is it cold! Seventeen below zero this morning. Happily we'll be up near 40 by the weekend.